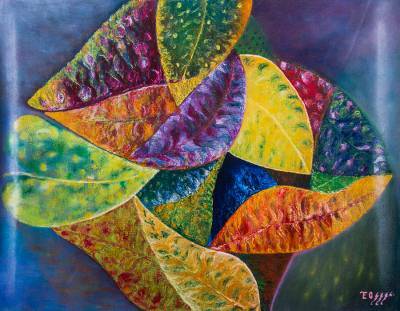 Peruvian Expressionist Oil Painting of Croton Leaves, "Pyramid of Leaves"
Croton leaves cluster in the center of a luminous blue background to flaunt their rich textures and beautiful colors. A favorite motif for Theus, the foliage invokes images of ancient civilizations. He recalls the sacred city of Caral, with pyramids built 5,000 years ago by the Norte Chico peoples. The Peruvian artist works in oils on canvas. Titled "Hojas piramidal" in Spanish.